"Do you happen to know Bohrlaken? I mean the village in the mountains - Bohrlaken on Lake Bohren? Odd - none of the people I ask seem to know Bohrlaken. Maybe Bohrlaken is one of those places known only to people I don't ask. Such things do happen." Recognize it? You and I have gotten to know Susan and Sharon, as played by Hayley Mills back in 1961, as identical twin girls separated in infancy by their parents who divorced shortly after they were born. Susan was raised by her father in California and is the epitome of a West Coast girl. Sharon is raised by her mother in Boston and is part of the East Coast elite. They meet at a summer girls camp and do not get along at all. At least, initially. Once they discover that they really are twins, they decide to switch places so that each girl can get to know the opposite parent. It is their end goal, of course, to get their parents to remarry. Disney didn't deviate much from the book by Erich Kastner, which was written in 1949. Identical twin girls, Lisa and Lottie, meet at a girl's summer camp. 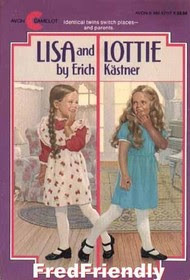 Except in their case, Lisa was raised by her mother in Vienna and Lottie was raised in Munich by her father. Lisa's mother has to work to earn a living for her and her daughter and selects photographs for placement in the local newspaper. Lottie's father is a composer and conductor for the orchestra in Vienna. I suppose an American audience would have had a hard time connecting to the idea of a Viennese conductor, but they can identify with an American cowboy. It was likely a very wise call on the part of Disney to give Hayley Mills some West Coast flare and some East Coast sensibilities. That we can identify with! The other notable difference between the book and the movies is the ages of the girls. In the Disneyfied version, the girls are teenagers and in the book they are nine years old. In both versions they dislike each other at first, simply because they happen to look alike. Lisa, having been raised by her father, is more feisty and is the one surrounded by friends at camp. In fact, one of her friends says to Lisa that she ought to "bite of her nose!" in reference to Lottie, which is a line put into the Disney film. As there is not much from the book that is quotable for film, I was glad that they took what they could! Lottie, in turn, is the more demure one who her mother refers to as her "little housekeeper" as she is good with numbers, shopping and general housekeeping skills. Lottie is the thoughtful, clever and kind one. The book does deal with topics like divorce (just like the movie!) but it's on the light and fluffy side of things. I would say that it is age appropriate for nine years old and up. At 136 pages, it is a fast read for an adult but a good chapter book for younger readers. In my opinion, Disney did good by this one! I'm impressed and I'm left liking both the book and the movie. See my list of Books Disney Films are Based On. I hope to read more of them soon! My favorite movie as a girl. I vaguely remember reading the original book as a kid - with the disney-fied cover of course. I bet this was a fun read! Oh, The Parent Trap is one of my most favorite movies, too! This book does sound like a winner, and I've never heard of it. Thanks, Carrie! Ha! I had no idea there was a book. I watched that movie a lot when I was a kid. I didn't know there was a book either, although I have read Emil and the Detectives several times and seen both Disney movies (it was one of my grandmother's favorite books). I agree that using the east coast/west coast theme was a good artistic decision. I am one of the few, however, who would find a Viennese conductor to be an interesting character. I also grew up loving this book!! It was years before I understood that the twins were the same girl. ;) I didn't realize this was based on a book. I vaguely remember watching the made for TV sequels. For the record, my favorite books on which Disney movies were based are Mary Poppins and Mother Carey's Chickens (Summer Magic). The Jungle Books are pretty fun, too. Cora's favorites are The Rescuers and Basil of Baker Street (Great Mouse Detective). Yes, she is very fond of mice. I hadn't realized "The Parent Trap" was from a book, either, though I should have guessed, as many Disney films were. Interesting! I'm glad he stayed close to the original. So glad you posted this, Carrie. I, like most of the other commenters, had no idea this book existed. Makes me want to read it AND watch the movie again! Well, that is cool! I loved that movie and had no idea it was a book. Definitely adding that one!